In the southern countries as the weather warms up, the air becomes more humid and eczema takes a back seat in many peoples lives. However this means that for those living in the northern countries the weather will cool down and the air will become dryer. This is not a good mix for many with eczema. This is a particularly troublesome time for Citizens of the Unites States as a recent international survey conducted by NOP World Health, showed that the USA has by far the most sufferers of eczema with 17.4 million Americans having the condition. The saddest part of these findings is that a large proportion of these 17.4 million Americans are children. Anyone who suffers with eczema or cares for someone with eczema will understand the anguish of the condition especially as the dry skin worsens in the dry weather. For some the dry skin is simply mildly annoying where for others the skin cracks and bleeds and becomes extremely painful. So once again we come to my favorite catch cry: Moisturize, Moisturize, Moisturize. The importance of moisturizing cannot be emphasized enough however it is not just any moisturizer that you need to use. Certain types of moisturizers will actually irritate the skin rather than help it. Avoid moisturizers that contain perfumes, as it is the astringent properties of these products that irritate the skin. Similarly avoid using soaps, or at least be careful of which ones you use. Avoid soaps with perfumes and look for ones made from natural ingredients. Also remember to apply a moisturizer after bathing or better still add a mild non-perfumed bath oil to your bath water. perfumes, so will not irritate or dry the skin. 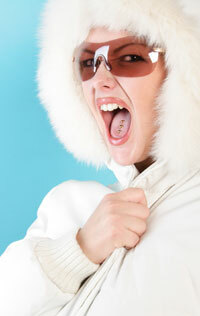 Why is it that wintertime is worse for eczema? In cooler weather the humidity of the air tends to lessen causing the skin to become dry and chapped. We seek refuge in artificially heated areas, however these forms of heating tend to dry the air more. The skin becomes dehydrated and chapping and dryness worsens. Using a humidifier in heated rooms will help to lessen the dryness of the skin but the main answer is finding a moisturizer that will penetrate the skin and lock in the natural oils. Many moisturizers stay on the surface of the skin and their benefits are not long lasting. This is why my personal favorite for moisturizing the skin is using a bath oil. Bath oils can be added to the bath water or applied directly to the skin. But once again not just any bath oil. Look for a bath oil that does not contain perfumes or additives. My bath oil of choice is the Grahams Bath Oil because it contains emu oil, which is the most penetrative oil known to man, therefore moisturizing deep into the skin layers. It offers a long lasting protective layer to the skin locking in moisture without leaving you with that greasy feeling.